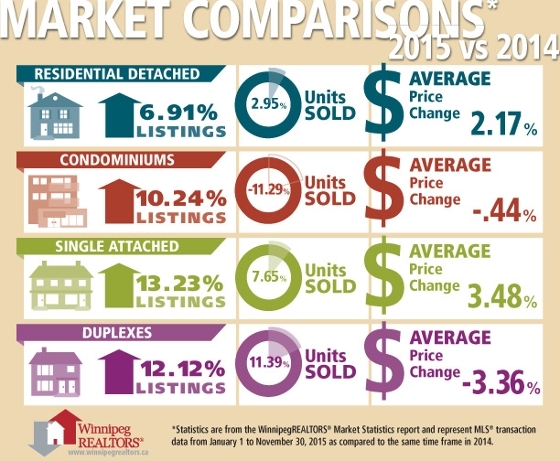 “We have said all along this year Winnipeg is a very stable real estate market with good fundamentals supporting it,” said WinnipegREALTORS® president David MacKenzie. $299,999 (22% of sales), followed by the $200,000- $249,999 (18%) and $150,000 -$199,999 (12%) and $300,000-$349,999 (12%). Average days on market for residential-detached sales was 41 days, a week slower than November 2014. The highest-priced residential-detached sale was $2.7 million. The least expensive sale was $49,000.